The HTC Desire 700 dual sim packs an 8MP camera that does stills of up to 3264x2448 pixels in 4:3 mode and up to 3264x1840 px ones in 16:9 mode. It's also capable of recording 1080p videos @ 30fps. There's an LED flash / video light, too. 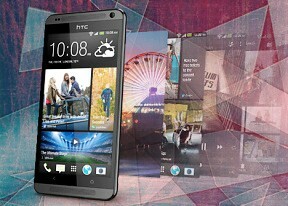 The camera has a wide f/2.0 aperture and a dedicated image processing chip (HTC ImageChip). The lens has a field of view equivalent to 28mm, meaning it's wider than usual and lets you squeeze more stuff into the frame. The camera interface, or HTC ImageSense, is the same for both the still camera and the video camera. It's pretty simple, as well. There are two shutter keys (one for stills and one for video), above them is the gallery shortcut and below is the effects button. On the left side of the screen you get flash mode selector and the settings shortcut button. The effects button brings out a tab on the left with the usual set of color effects (sepia, solarize and so on). There's also some other cool effects such as shallow depth of field , which lets you blur parts of a photo that fall outside a predefined circular area. It's like having Instagram built right into the stock camera app. The HTC Desire 700 dual sim camera has touch focus and face detection; geotagging and smile shutter are also enabled. The shot mode button offers some more cool stuff - HDR photos, Panorama (with a gyro horizon), portrait, group portrait, landscape, whiteboard, close-up and, finally, low light. Overall, the Desire 700 dual sim camera produces pleasant-looking images. Colors appear nice and the photos have an appealing unprocessed look. Unfortunately, as a result from this laid-back processing they come out quite soft. That's strange as we are used to seeing oversharpened photos from phones and not undersharpened ones. Another drawback of this laid back processing is that the camera doesn't take care of the chromatic aberrations - this is probably the worst case of purple fringing we've seen in a phone. That's not to say that other cameraphones don't have to fight that same problem - they simply remove it with clever post-processing and end users don't get to see it. Yet here, it's all there. While the HTC Desire 700 has a built-in HDR mode, but the effect is too exaggerated and the images aren't mixed too perfectly, so the results are far from exciting. Finally, we come to the macro capabilities. Here the HTC Desire 700 produced stellar results. It was able to get really close to the target and produced nice detail with light blurring behind it for a result with a shallower depth of field. The Desire 700 dual sim joins the big family of 8MP shooters in our Photo Compare Tool. We've let it go against the Samsung Galaxy S4 mini and the Sony Xperia C.
The HTC Desire 700 dual sim can shoot videos at up to 1080p resolution at 30fps. It has an HDR option for the video, but note that when you enable it, the camera's field of view gets narrower. There is also a slow-mo video recording mode, which however is shot at a lower resolution. Videos are recorded in MP4 files with a bitrate of around 14-15 Mbps. Sound is captured in mono with a lowly 96Kbps bitrate and 48kHz sampling rate. Framerate was hovering the 21-22 fps mark, making it not the smoothest around. Detail on the HTC Desire 700 videos was impressive and focusing was spot on. Colors were okay if on the colder side. Even sound is okay at mono. What really ruins the experience is the choppiness of the videos, due to the lower framerate. There were dropped frames as well. Here goes a sample for you guys. We've also prepped an HDR video sample, which has a resolution of 768 x 432 px. Maybe we've been spoiled by devices like the Samsung Galaxy Note 3, but the slow motion quality of the Desire 700 isn't good and looks more like 240p to us. HDR in video is the same deal as in imaging - not up to par - the video sample was barely distinguishable from the original sample and we decided it's not worth uploading. We've added the HTC Desire 700 dual sim to our video quality comparison tool. It will be facing the Samsung Galaxy S4 mini and the Sony Xperia C.